Should You Retire Your Mortgage Before You Retire? If you are planning not to pay off your mortgage before retirement, you will not be alone. If you plan on paying off your mortgage before retirement. 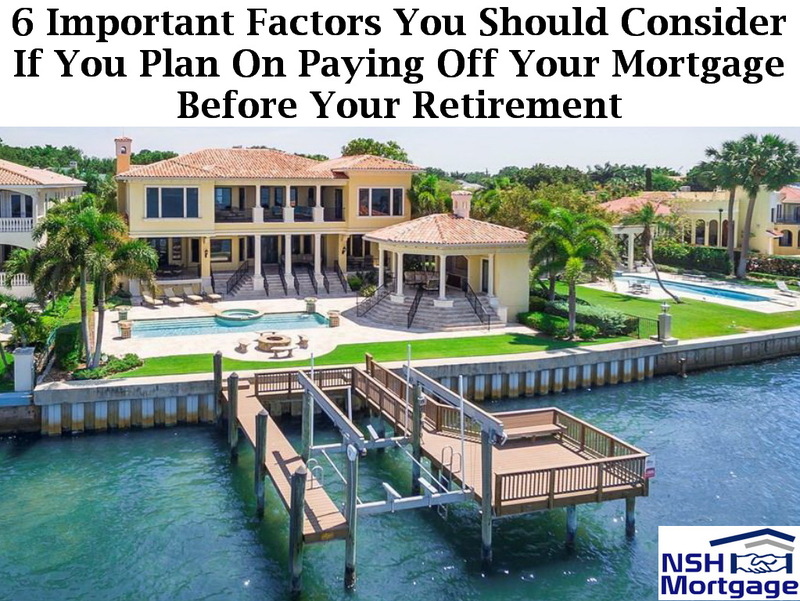 NSH Mortgage has the knowledge and tools that can help you with your retirement planning. You should also note that fewer than half of owner occupiers in the age group of 65 to 69 years were actually mortgage free in 2015. This record low number came from an October 2017 study by Fannie Mae. But the report revealed something even more surprising. Younger baby boomers, in the 50-59 years cohort, were actually more likely to own their homes outright than people the same age were in 2000. In other words, this tendency to carry mortgages through into your retirement may now be losing ground. Habits have the possibility to change in any kind of direction. In all honesty you never know which direction in life is best for you and you should always ask yourself if this method is right for you to take. So, should you be re-thinking about if and when is it a good time to pay off your mortgage? It is certainly a lively debate. They have no choice. Especially, following the Great Recession, many have seen their financial plans blown off course. They strategically choose to keep their mortgages going. While, some arguments for doing this to maximize wealth are quite compelling. Those in the first group can do little about their predicament. But those who choose keeping this debt in retirement might want to keep their decision under review. Does the end of your mortgage term happen to coincide with your retirement date? If not, paying down your loan by that deadline will mean paying more than your required monthly payment. If you have a pile of higher interest debt. As a rule, you should pay down accounts with the highest interest rate first, and then work your way down to the lowest interest account. That is almost certainly your mortgage. If you do not have a good emergency fund. With medical expenses likely, you are almost bound to need ready cash more in retirement than at other stages of life. If you are stinting on your 401(k). Also, if your employer is matching your contributions to your retirement fund, make sure you get the maximum benefit possible. If you have a big mortgage and will be itemizing your tax deductions once you are retired. Make sure you do the math before hand so that nothing unexpected will happen to you later on. If you are expecting to relocate or downsize. Just pay off your mortgage as part of that transaction. If you can get a better return on your money elsewhere. With mortgage rates so low with it being generally tax deductible and with markets so high. The chances of finding an investment where your cash will earn more are excellent. Most of those have been common sense for generations. But that last one has become more influential more recently. Furthermore, this is one thing that needs the most thinking through ahead of time. This statement at least contains a some truthful insight to the first law of investment. Whereas, few small, amateur investors can fully investigate stocks in which they invest. Nor can they track trends and changes in real time. Large institutional investors with sophisticated automated trading are better positioned to protect themselves and react swiftly. Individuals can be left holding the bag when bad news erupts. Perhaps the first financial bubble happened in 1636 through 1637 in the Netherlands. At one point, a single tulip bulb was worth the same as a house on an Amsterdam canal. That sounds stupid now. But falling for the allure of a big shiny bubble has nothing to do with intelligence. In the 1720s, Sir Isaac Newton lost his shirt in the South Sea Bubble. And bubbles have been a feature of capitalist economies ever since. The Great Depression followed one. The dot-com or tech bubble inflated between 1997 and 2000. A debt bubble burst in 2007 to 2008. Of course, alarmist predictions of economic doom can be a dime a dozen. But, after many years of booming stock markets, it is easier to forget a simple fact. Whereas, there are returns to a reward but it will have own kind of risks involved. Besides, you need to remember the higher the reward, the greater the risk. It is one thing to take risks when you are young or middle aged. But, by definition, retirees are in a less strong positions to recover from losses. In fact, they may have less time to do so. Additionally, they may also have fewer opportunities to earn enough to return to their previous levels of wealth. Of course, managing risk does not mean avoiding it completely. If you spread your money across enough (FDIC) insured certificates of deposit and savings and money market accounts, you can be pretty sure you will not risk losing a cent. But you can be certain you will watch your wealth being whittled away by inflation year after year. That is why a diversified portfolio is so important in retirement. Mutual funds are one way to diversify your stocks and reduce your risk. Laddered CDs are another way to increase your earnings without risking your principal. You need enough salted away in safe investments to keep you afloat if your risky ones blow up. Paying down debt counts as an investment. True, you do not get a positive return on your money. But the interest payments you save are just as real as any dividend or yield. You have to decide whether paying off your mortgage before you retire fits within your diversified portfolio. Your return will not be handsome if you do, especially if you are going to itemize your tax deductions, but it would certainly count as one of your safe investments. In fact, if a depression, recession, or economic meltdown. It will feel better that you have gotten yourself mortgage free ahead of time. So, that you will be able to face off with any of these kinds of events if they ever occur and you will be able feel accomplished with heads held high because you know that you are free from possibly losing everything. Finally, paying down a mortgage does not necessarily mean closing down your options. Providing you remain credit worthy, you could still likely borrow against your home with a new mortgage. Alternatively, you may prefer to borrow using a home equity loan or home equity line of credit (HELOC). In fact, you could still borrow using a reverse mortgage or home equity conversion mortgage (HECM). Which is a reverse mortgage backed by the Federal Housing Administration. You have to have cleared your original mortgage to be eligible for one of these. However, you can use some of the proceeds from the new loan to pay off any small balance on that original one. That opens the possibility of being free of mortgage payments, while still borrowing through a mortgage. In fact, that is something you may find attractive. Just be sure you understand all the potential disadvantages before you commit. Nothing is certain in this world. That is why there are no automatically correct answers for retirement planning. It all depends on your resources, your needs and your appetite for risk. Actually, this is why it is usually a good idea to seek advice for that planning from a reputable, independent professional. Just be sure you and she are on the same page when it comes to risk management.